An effort to relocate a family of beavers found living at a Highlands river has been suspended after two of the animals died. The Scottish government ordered the trapping and removal of the beavers from the river near Beauly because they had been released illegally. One of the dead animals had suffered an eye deformity and infection. The cause of the other beaver's death is unknown. A third beaver is in the care of the Scottish SPCA. The existence of the family of beavers was made public by conservation charity Trees for Life. It asked the government to consider leaving the animals where they were. The charity's chief executive Steve Micklewright said: "We are deeply saddened that the Beauly family of beavers has now been split up and two of them have died in captivity. "Beavers have been in the area for five-eight years with no local concerns or controversy. Many people had no idea they were there." Beavers have recently been recognised by the Scottish government as a native species. Mr Micklewright added: "Native species require protection. The government should have explored all other options before trapping and removing this beaver family." But Scottish Land and Estates said the decision raised concerns that the population may grow in future months. Policy officer Karen Ramoo said: "The suspension of trapping measures for the illegally-released beaver population at Beauly has been met with surprise by land-based businesses in the local area. 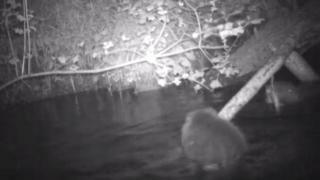 "Cabinet Secretary Roseanna Cunningham was clear in July that "swift action" was required in Beauly but little explanation has been given on why attempts by SNH to capture and relocate these beavers have now been curtailed. "We are concerned that such a delay may allow the population the chance to grow and to increase their range, with little management in place to stop this from occurring."